nutrient spotlight: protein one serving provides more than half your daily requirement (71 g). Combine arugula, cherry tomatoes and white beans in large bowl. Heat 11/2 tablespoons of olive oil in a medium nonstick skillet over medium heat. Add garlic, chicken tenders and several pinches of salt and pepper; saute until juicy and just cooked through, about 5 minutes. Add to salad. Whisk remaining 21/2 tablespoons of olive oil with vinegar and mustard in a small bowl. Drizzle dressing over salad; toss to coat. 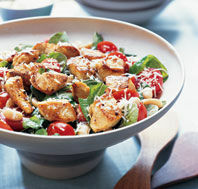 Divide salad among four dinner plates and sprinkle with Asiago cheese. Nutritional information per serving (21/2 cups with 1/4 pound chicken tenders): 445 calories, 32% fat (16 g), 31% carbohydrate (34 g), 37% protein (41 g), 7 g fiber, 5 mg iron, 343 mg calcium, 146 mcg folate.